Canyoneering is an activity that involves hiking as well as rappelling, downclimbing, route finding, rope work, and swimming in cold water to allow you to see much more remote and secluded scenery than you could by simply hiking. 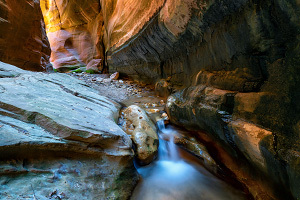 Zion National Park is considered a mecca for canyoneering with several world-famous canyons like the Zion Narrows and the Subway, as well as countless obscure and remote canyons. 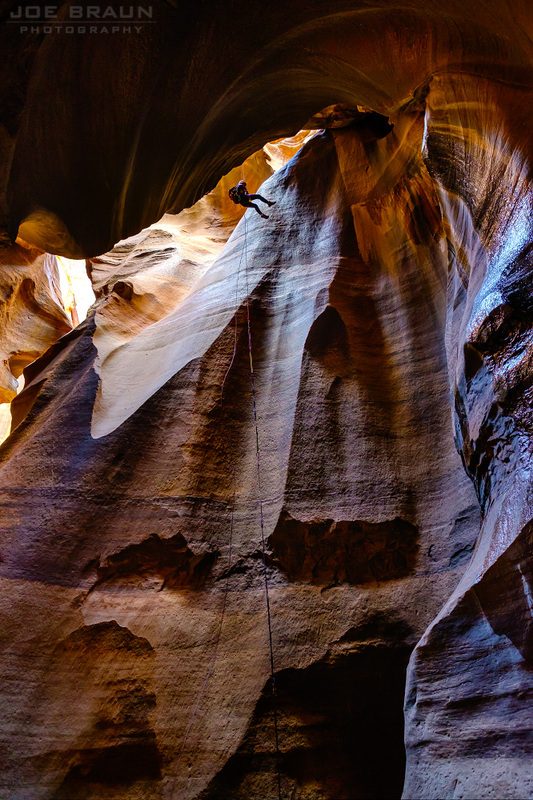 These routes are not suitable for hikers who have no technical canyoneering experience. A canyoneering permit is required for any canyoneering route that requires the use of descending gear or ropes. Reservations for the well-known canyons can be made online and you must pick up your actual permit at the Wilderness Desk the day before or the day of your hike. A lottery system is in place for Subway and Mystery Canyon permits due to their epic popularity. Detailed permit info can be found on the NPS website. You need a climbing harness and a rappel device (ATC-type device or a device like the Petzl Pirana) and you must know how to use them for rappelling. You need canyoneering rope long enough for the longest rappel. Static canyoneering rope is prefered to dynamic climbing rope. (Note: general-purpose rope that you find at the hardware store is absolutely NOT acceptable.) You typically bring double the length of the longest rappel since you pull and take your rope with you. Inspect all anchors before you rappel off of them. While rappel stations in the popular canyons are usually in good shape, they are not officially maintained by NPS staff. 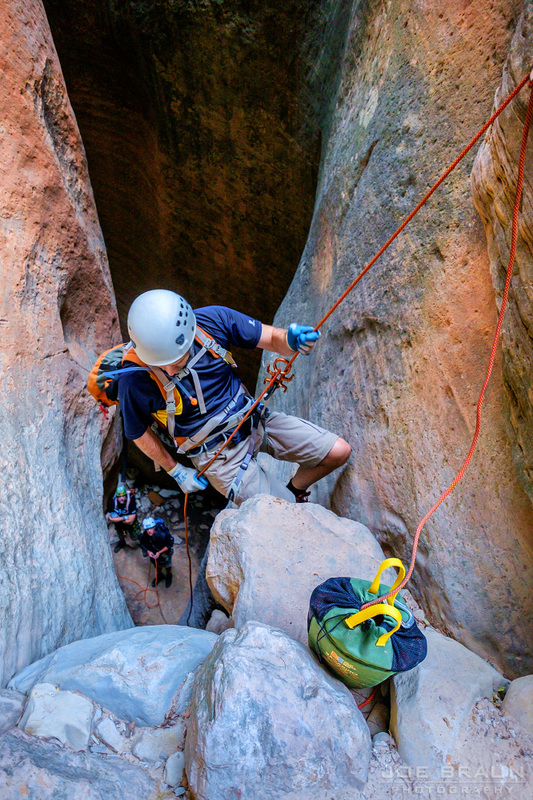 Bolts and webbing are replaced by white knights in the canyoneering community. You should bring webbing and a few rapid links and be knowledgeable to clean up any anchor that looks like it's in bad shape. Your safety is your responsibility. Be prepared to get wet and cold. Most canyons have sections of water, often in dark corridors that don't get much direct sunlight. Bring drybags to protect all of your camera gear, electronics, and anything else that needs to stay dry. Canyons like Keyhole Canyon and Pine Creek have perpetually cold swims, so you will want a wetsuit even on a hot day in summer. Be prepared to deal with random obstacles. Many canyons have short drops that require careful downclimbing, chimneying, and/or stemming. Good upper-body strength and some climbing experience are very useful. Random logs and debris will need to be evaluated and navigated. Flash floods are a real danger and have killed several people over the years. Pay attention to the weather forecast and cancel your canyon plans if there is a threat of rain. Your safety is your responsibility. You cannot hire a guide to take you through the technical canyons of Zion National Park; commercial guiding is prohibited. Outfitters in the area do offer canyoneering training classes and they also lead canyoneering adventures in public lands outside of NPS. Most outfitters also rent canyoneering gear (harnesses, wetsuits, footwear, drybags, etc. ), but typically not rope. Do not poach any canyon that you do not have a permit for. Rangers can and do ask to see your canyoneering permit, especially in popular canyons like the Subway. The Subway "top-down" route via Russell Gulch is the classic way to hike the Left Fork of North Creek. This route is a long strenuous day and it involves several short rappels, a few downclimbs, and several cold swims. Starting from the Wildcat Canyon Trailhead, the hike goes down Russell Gulch to join the Left Fork. The highlight is the half-mile section of canyon known as The Subway. Once beyond the Subway section, the canyon opens up and it is a less-interesting hike out to the Left Fork Trailhead. This amazing hike is well worth the effort! Orderville Canyon is the amazing little sister to the famous Zion Narrows and is a good long day hike for beginning canyoneers. The lower sections can be explored as a side hike from the Zion Narrows, but the much better way is to do the top-down "semi-technical" canyoneering route. This hike involves two short rappels, several short swims, and a lot of downclimbs over boulders and rock formations. The canyon is tall, narrow, dark and wonderfully mysterious, and it is well worth the effort that it takes to get through it all! Keyhole Canyon barely shows up on a topo map, but it is a beautiful little subterranean slot that offers up some amazing other-worldly slot canyon scenery. 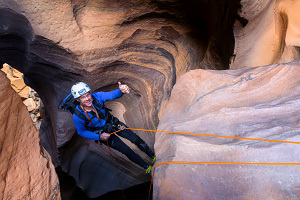 This route takes roughly two hours to complete and involves 2-3 short rappels, and as such, it is quite a popular route for beginning canyoneers. This canyon also has many down-climbing obstacles, and a few wades and swims through cold water, so even though it is short, it should still be taken seriously. Full technical gear is required and wetsuits are recommended. 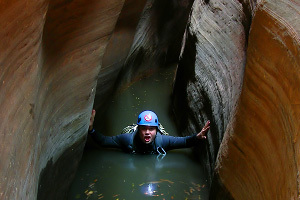 Pine Creek is one of the most popular technical canyoneering routes in Zion National Park and exemplifies the beauty of subterranean slot canyons. Starting at the Canyon Overlook parking lot and ending at the Route 9 switchbacks in the main canyon, Pine Creek is one of the few beautiful slot canyons that features such easy access. Although it is one of the easier technical canyons in Zion, it is still serious business with several rappels, downclimbs, and many swims through cold water. This route features the beautiful "Cathedral" section (complete with an arch doorway) and the final rappel -- an intimidating 100-ft free rappel. Rating: fairly strenuous technical canyoneering. 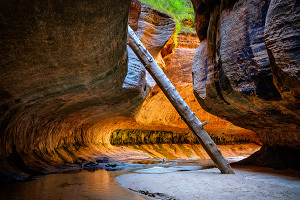 Mystery Canyon is indeed a mystery… a deep and beautiful hanging canyon that feeds into the bigger Zion Narrows. This "hike" is one of the the crown-jewel canyoneering adventures in Zion National Park, featuring a steep and intimidating entrance, numerous rappels in beautiful dark sculpted narrows, an enormous landslide/rockfall obstacle in the middle of the canyon, and two big-wall rappels near the end that really get your attention. 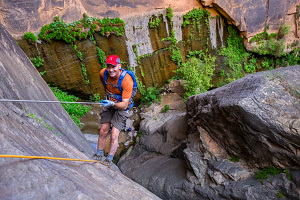 The grand finale is the rappel down Mystery Falls that lands you right in the Zion Narrows only a quarter of a mile upstream from the Temple of Sinawava. Show me even more hiking ideas!